HostBill order pages: How to create website that sells. HostBill Update – New App Store & Custom Dev Services! New website, New App Store, New Licensing Options! Order Pages, Client Areas, Modules, Plugins in one place! We’re quite aware that our recent changes in billing model/platform may have caused unintended confusion – we’re here to straighten it up. All changes in pricing/renewal fees are for new customers only. HostBill respects “grandfather rights”. If by accident you did not received what you’ve paid for (renewal fee shows as different, your access to download shows as expired), please contact Licensing Department. You’re still free to use mentioned modules – those become paid for new customers only. Bug fixes will be provided in future for both free and paid versions. New features will be introduced for paid versions. Update to newer version do not remove orderpages that came with your HostBill when you bought it or with updates up to recent version. This means that you still are good to use orderpages you’ve bought with your HostBill. Prices for orderpages listed as premium/paid are for new customers only. Q: Will I get new HostBill features/improvements/bug fixes? A: Yes. All free core features, improvements and bug fixes are released weekly, as before. Q: Do I have access my HostBill’s API? A: Yes. Access to API and hooks, template and orderpage modifications is not limited! Q: I signed up before 4.6.0 release, if I download new version are orderpages that I previously used going to be there? A: Yes. You have access to what you’ve signed up for. Q: Can I develop my own extensions or use third party modules? A: If you’ve signed up before 2013-05-26 (TOS/License update) than YES. Friday? So time for another exciting HostBill developments. Our new clientarea theme stands out with its modern design approach – we went extra mile and created new orderpage to match its unique style. 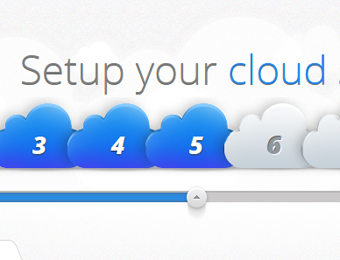 Introducing Volume Slider orderpage – make sure to see its video preview! Another exciting updates from HostBill team! 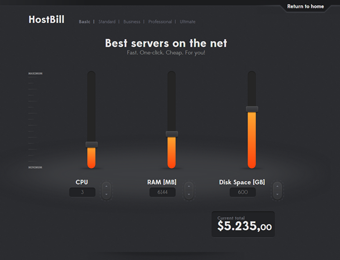 As always, we’re happy to announce that HostBill 4.2.8 is now available to download. So, whats new? New orderpage: Dark Bootstrap sliders. You can now group your customers into client groups. This feature in HostBill allows discount per group, default ticket priority in group, order scenario and even override automation settings, like suspend or terminate for all clients under certain client group. 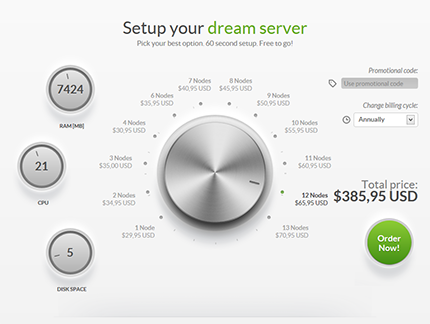 Another amazing orderpage from HostBill team – this time we’ve gone 3D! 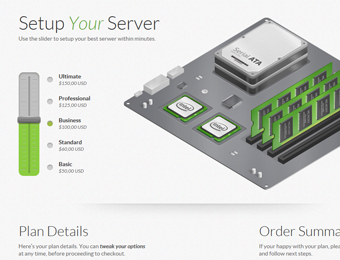 Check out isometric view of motherboard filling with hardware (ram, cpus and storage) as your clients orders higher packages. Designed to boost your sales! Another exciting week of development passed – we’re happy to announce that HostBill 4.1.4 has been released. Whats new? HostBill offers vast selection of amazing, high quality orderpages – when it sometimes may be hard to decide which one to use, its best to use one that works well with your offering/site/business model. So lets your clients decide which one to use! With this simple yet very effective plugin you can utilize Google Analytics Experiments to perform A/B testing.